Are You Checking Your Arborvitaes (and other Evergreens) for Bagworms? 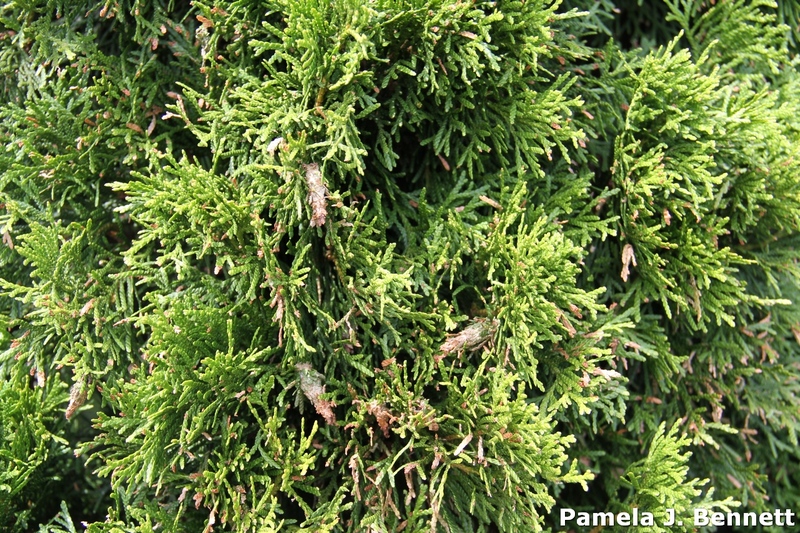 Have you looked closely at your arborvitaes and other bagworm-susceptible evergreens such as Juniper? Bagworms are a little easier to see now as the needle clad "bags" are beginning to turn brown. These caterpillars can creep up on you and strip a plant before you know it so keep your eyes out and regularly inspect. I have been watching a nearby arborvitae and noticed that the bags on this particular plant in Clark County are anywhere from 1/4" to 1" in size. As they get bigger, they are much easier to spot. When bagworms first hatch, it's even a challenge to the untrained eye to find them. For more information on control see Joe Bogg's BYGL post on June 2, 2016 or Dr. David Shetlar aka BugDoc's Factsheet on Bagworm.